“He’s a good racer,” said Hamilton, gracious in defeat. 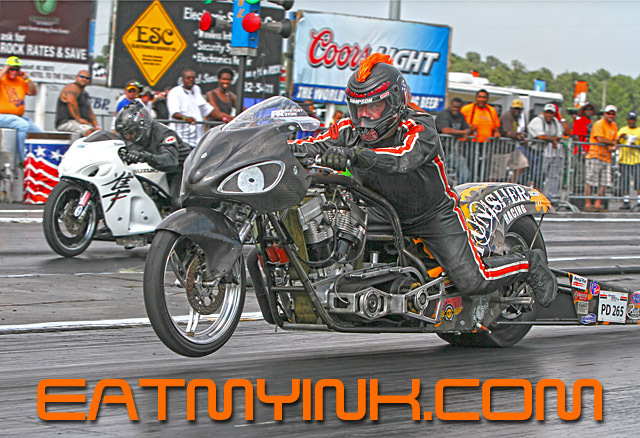 Big money, track records, a dramatic high speed crash, and quickest-ever side-by-sides were all part of the show when the Mickey Thompson MIROCK Superbike Series rolled into Steve Earwood’s Rockingham Dragway for the 18th annual FBR Shop Summer Sizzler on August 15-17. Highlighting the bill was the $5000 to win Nitrous Express Pro ET purse on Saturday—MIROCK’s biggest-ever sportsman payout. 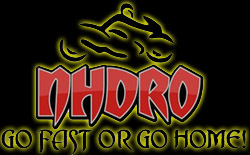 A whopping 110 entries went mano y mano for the Big Money, courtesy of Rockingham Dragway, Schnitz Racing, the FBR Shop, Nitrous Express, Shinko/WPS, Shutt Electronics, and MTC Engineering. 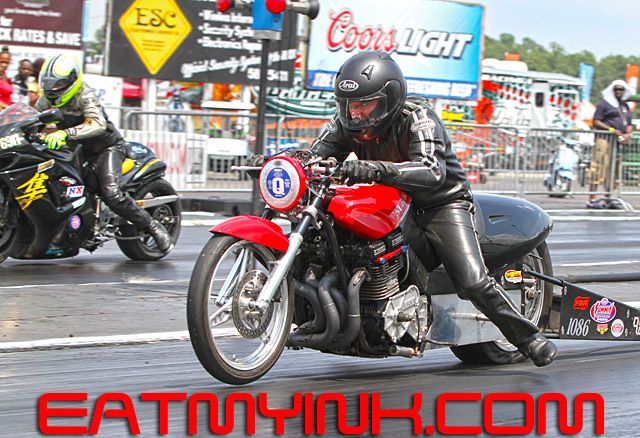 Veteran MIROCK racer Dale Hamilton seemed particularly poised to take away the big prize, as he’d entered himself riding two separate motorcycles and both reached the semifinals! Both ended up on the same side of the ladder, meaning that Hamilton essentially had a bye to the final at that point. 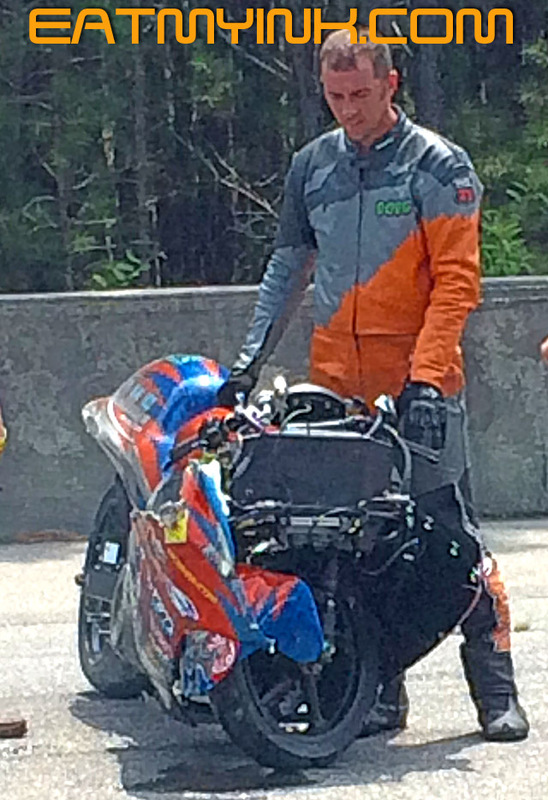 But on the flipside, he was denied the opportunity of putting both bikes in the final and ensuring himself the win. Meanwhile on the other side of the ladder, unheard-of Virginian Brian Guarino—racing his first MIROCK event ever—also had a bye to the final. 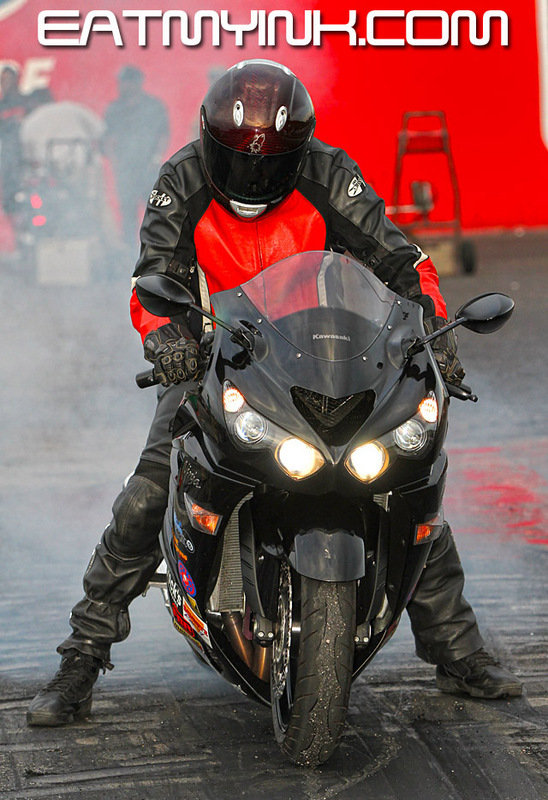 Both riders were on streetbikes—Hamilton on a Suzuki Hayabusa and Guarino on an especially inauspicious GSXR. Big man Hamilton left first with a 9.66 dial-in, but Guarino left quicker with an .018 reaction time. 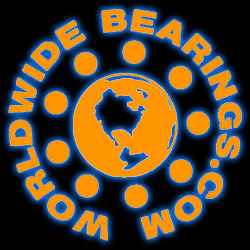 Hamilton ran only .014 off of his dial but his .050 light did him in. The guy no one had heard of came in and took away the biggest payout ever away from the East Coast’s toughest bracket racers. The Summer Sizzler was a double event for pro classes, with the rained-out Spring Bike Open still in play. The DME turbocharged ‘Busas of champion Joey Gladstone, Jason Dunigan, Terence Angela and Ehren Litten were hoping to make it an all-DME Orient Express Pro Street semi for team boss Dimey Eddinger, but that dream ended in a dramatic way when Litten’s right front fork snapped just before the finishline on his first qualifying pass Saturday. 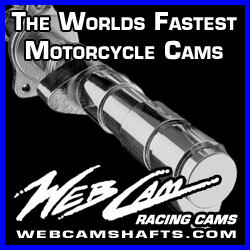 Litten tumbled and slid into Doug Gall’s lane to the right while his bike grinded along the clutch cover hard into the left-side wall. Both Litten and the bike went through the traps separately with a 7.49 at 154 mph—good enough for fifth in Q1! Litten was a little scraped and bruised but mostly OK. Gall got his bike stopped incredibly quickly and—always a joker—walked up to Litten with hands outstretched, saying “What did you do that for?” Litten’s bike was covered in fork oil and not OK, requiring a thorough going over back at the DME shop in Winston-Salem. Gall lost the Spring Open semi to DME’s Angela, who then went on to face teammate Gladstone in the final. Aruban Angela had crucial lane choice and took the win when Gladstone floundered off the starting lane. But there was no floundering for Gladstone when the Summer Sizzler eliminations ran on Sunday. Running consistent 7.0’s except for that Saturday final against Angela, Gladstone blistered Rockingham’s PJ1-prepped quarter mile with a track record 6.92 against Gall in the semis. Gladstone’s dad (and engine builder) Skip quickly ran over to Rockingham starter “Little Man” and congratulated him for delivering a record-breaking track in the heat of an August afternoon in southern North Carolina. Dunigan beat teammate Angela in the other lane to set up the final against Gladstone. This time Joey had the lane he wanted and Dunigan pushed the tree in an effort to gain an advantage. It was too much. Dunigan redlit and Gladstone took the win. David Merks backed up his recent Valdosta Man Cup win with his first ever MIRock DME Real Street win, this time over his RS Motosports teammate Jeremy Teasley. 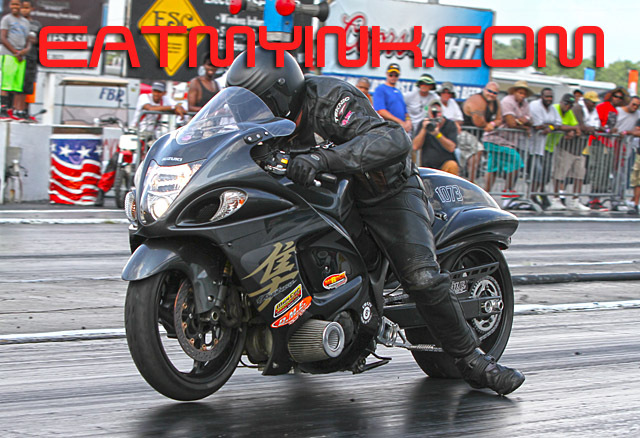 As Roger Starrette dialed in Teasley’s tune, he said “It’ll wheelie somewhere out there, or it might run a 7.98….” It ran a 7.98, not good enough for Merks’ turbo ‘Busa. 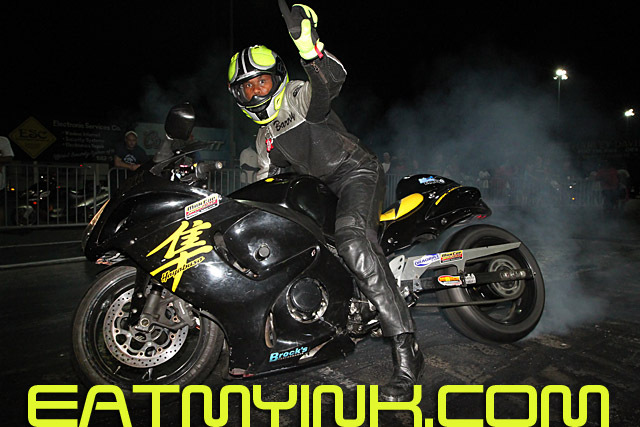 Merks went to the final again on Sunday, this time facing Maryland winner Rickey Gadson and his turbo Kawasaki ZX14R. The result was what many railbirds are saying was the quickest-ever side-by-side Real Street race. Merks’ 7.74 at 185 was quicker and faster, but Gadson’s better reaction time put his 7.78 in the winners circle. 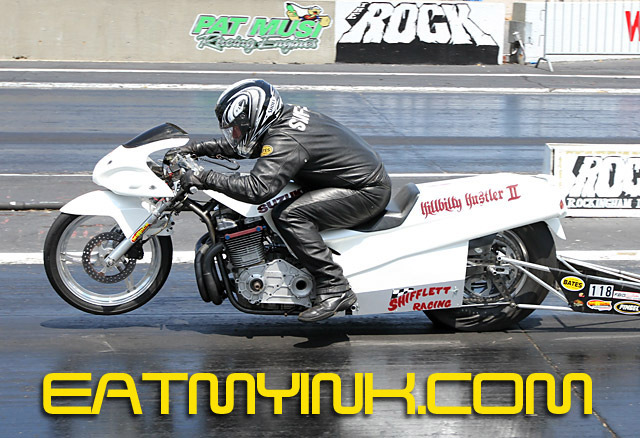 Dale Nilles’ Pro Dragster nitro Harley won the Spring Open Louis Concrete 4.60 race on Saturday, overcoming number 1 qualifier Eran Pielert’s .015 light in the final of the world’s quickest motorcycle index class. Gadson’s nephew Richard joined his uncle in the Rockingham winners circle with his own 4.60 win aboard Willie Jones’ Kawasaki on Sunday, and once again Pielert was the runner-up. It was the first time both Gadsons won at a MIROCK event. “Willie’s had a hard time running the number, so he put me on it hoping it would go .60s,” said Gadson, who ended up besting with a .58. 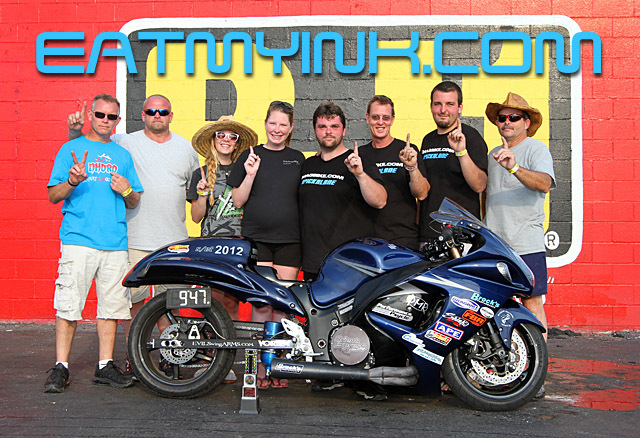 Tealsey may have stumbled in the class he usually dominates—DME Real Street—but he scored a Trac King/APE Top Sportsman win on Carroll Craft’s ‘Busa. Teasley rode the bike normally reserved for brother Cameron to the win when Kawasaki Kingpin Bob Carlson broke out in the final. 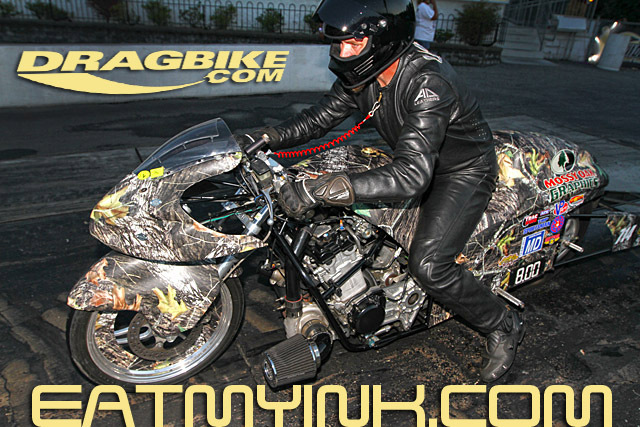 Teasley also rode Craft’s ‘Busa to the Cycle Connection Crazy 8s and FBR Shop 5.60 finals—a pretty remarkable result. Teasley lost Crazy 8s to young Kyron Drake, and 5.60 to Long Islander (and 5.60 points leader) Michael Ostrowski. 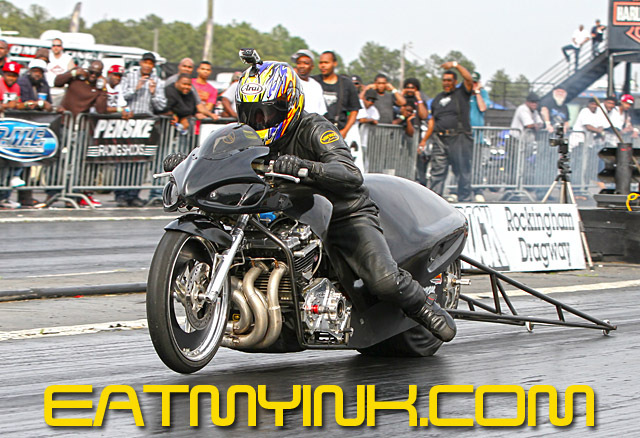 Ostrowski nailed a .009 light aboard his dragbike. Scottie Keller won Nitrous Express Pro ET a day late, beating Shayne Proctor in Sunday’s final when the purse was the standard $2000. Barry Pryer Sr. hot-dogged his way to Saturday’s Brock’s Performance Street ET win over Baybay Yarbrough, showboating in the waterbox and flipping on his emergency flashers down track. 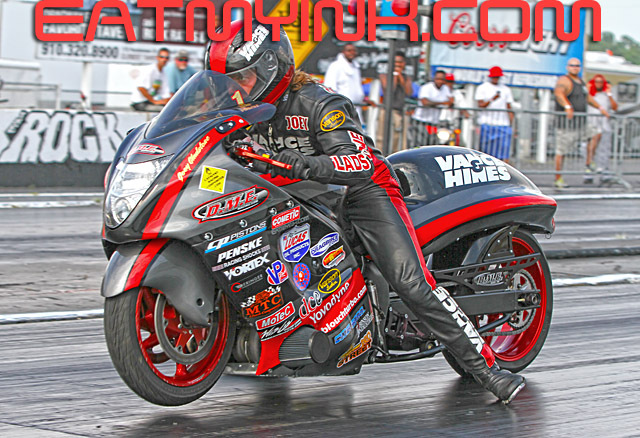 Tennessee’s Dustin Lee won on Sunday, beating Fun-For-All’s Ron Arnold with an .019 light in the final. Richard Gadson laps Anibal Merced’s grudge bike in anticipation for some nighttime action. According to CJ400, Anibal’s camp wanted to race CJ’s ’14, which according to CJ is 7 inches shorter, to the eighth only…. 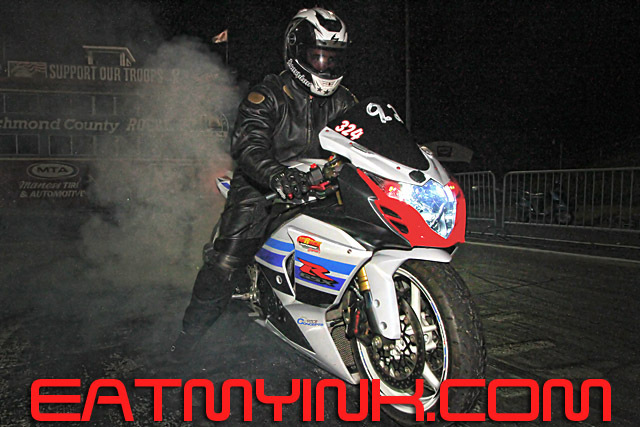 Richard Gadson also lapped on the Anibal Merced-built “Deebo” grudge ZX14 in Afterdark Underground. Jeremy Tealsey was making passes on CJ400’s ’14, and one would hope these two camps would figure something out….they didn’t. 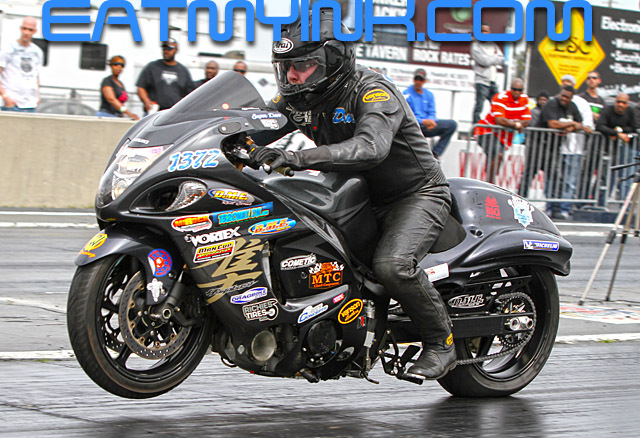 Top Fuel is back on the card when the Mickey Thompson MIROCK Superbike Series returns to New Jersey’s legendary Atco raceway September 5-7 for the 45th annual Orient Express U.S. Motorcycle Nationals. 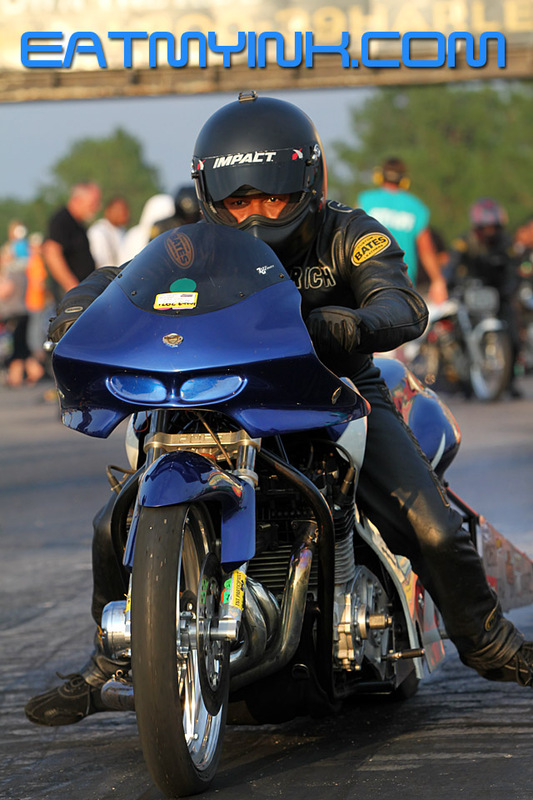 Riding its biggest wave ever, the already huge Mickey Thompson MIROCK Superbike Series makes its return to legendary Rockingham Dragway for the 18th annual FBR Shop Summer Sizzler on August 15-17. And Rockingham owner Steve Earwood is welcoming everyone back with a guaranteed $5000 to win Nitrous Express Pro ET purse on Saturday. “No minimum field, and the normal entry fee applies,” said Earwood. “That as big as any Pro ET purse ever that I’m aware of.” You can bet there will be some serious glares and gamesmanship going on in the lanes, at the tree, and at the stripe for this one. 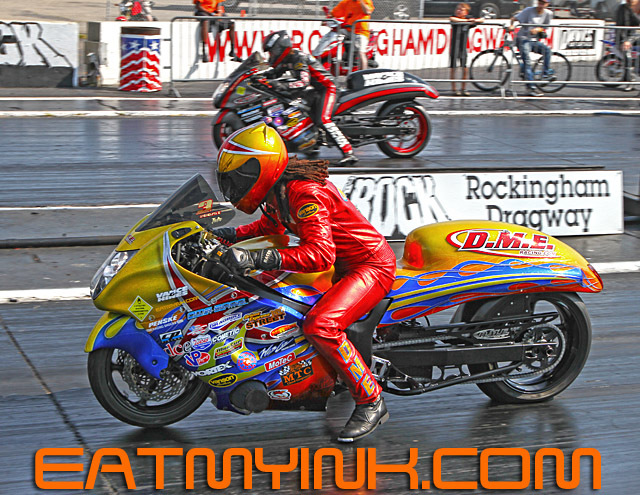 It’s the perfect way to step up Rockingham’s game in favor of Sportsmen racers following the outstanding MIROCK debut of Top Fuel at Maryland a few weeks ago, and the season starting Adams Performance Spring Bike Open—Rockingham’s biggest-ever MIROCK opener. Rain, wind and unseasonable cold shut Rockingham down after only one round of eliminations during the ironically named Spring Bike Open. 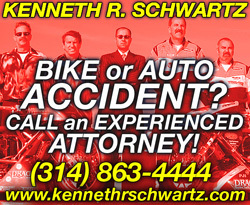 Sportsman purses were split, and Pro classes postponed until the FBR Shop Summer Sizzler. That means two races in one on Rockingham’s PJ1-prepped quarter mile for the fans and pro competitors. 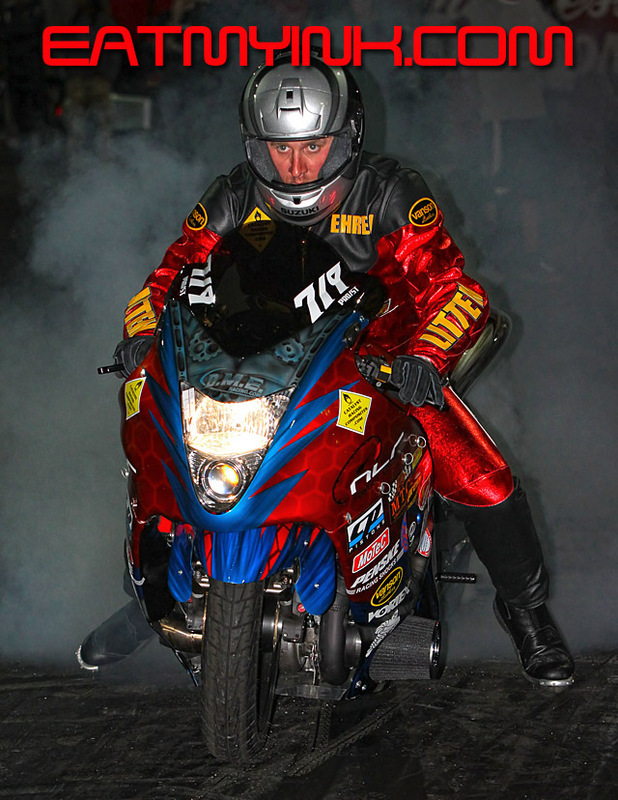 The DME turbocharged, Suzuki Hayabusas of champion Joey Gladstone, Jason Dunigan, Terence Angela and Ehren Litten locked out the top four Orient Express Pro Street qualifying spots and were all still alive when racing ended on Sunday. “Would’ve been an all-DME semifinal,” predicted DME boss Dimey Eddinger, and they’ll get a chance to prove it against Darion “Nanu” Payne, Rendolf Torbed, defending race winner Doug Gall, and John Gover during qualifying on Saturday. And then guess what? They and more get to do it all over again on Sunday! 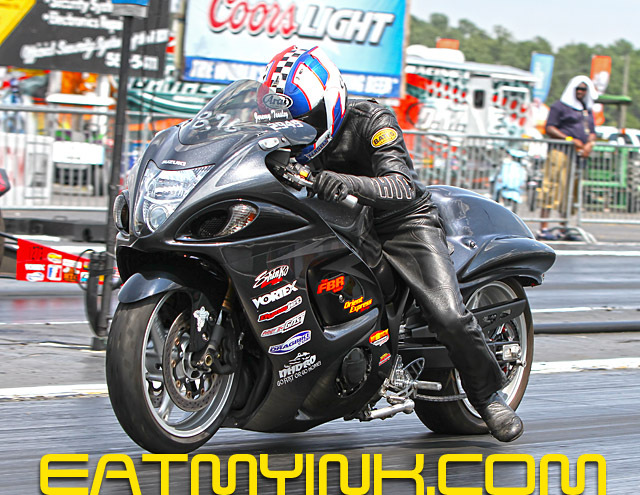 Back in April, Super Dave Stewart led DME Real Street qualifying on his turbo ‘Busa, and will face Cameron Teasley in round 2 of eliminations on Saturday. Perennial Real Street champion Jeremy Teasley faces Eddie “Who” Chapman, and teammate David Merks faces fellow big man Anibel Merced. 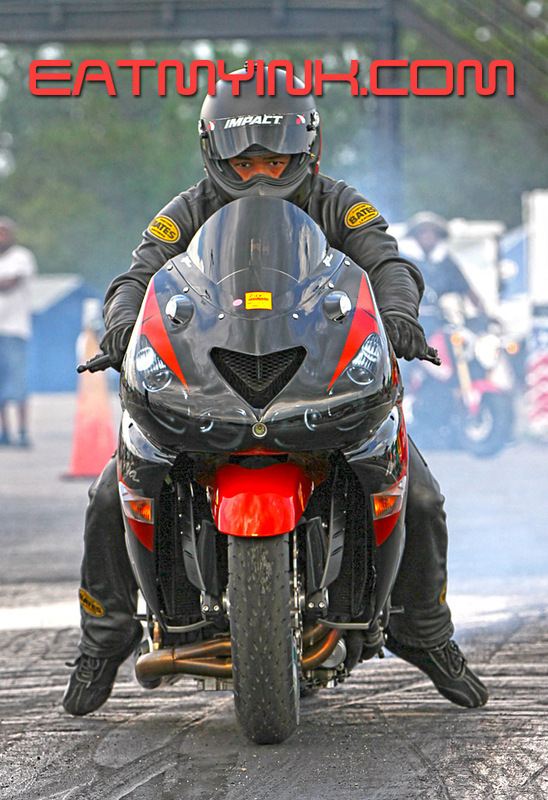 And like Pro Street, another whole race runs on Sunday—this time with Maryland winner Rickey Gadson able to join the mix. Maryland racer Eran Pielert led Louis Concrete 4.60 qualifying with a 4.615 in April, then advanced to round 2 where he will face Baybay Yarbrough on Saturday. Barry Harvey, Ronnie Smith, Dale Niles, and Kevin White also advanced, but not champion Kenny Cornnell, who will have to wait ‘til Sunday for his chance to race. Trac King/APE Top Sportsman takes the quickest 32 of every Pro ET field and throws them in the same snake pit together to see who survives. Studs like Jay Windsor, George Shriver, Brian Canoles, Jimmy Shifflet and legendary Virginian Boo Brown are usually alive at the end of the day and striking for a championship. Cycle Connection Crazy 8s might see its biggest Rockingham field ever in August, with no-bar index diehards like the Teasleys, Floridian Robert Parker, Connecticut Kawasaki Kingpin Bob Carlson, Buckeye Ben Knight, Fun-For-All’s Ron Arnold, Clay Davies, Richard Gadson…..the list goes on and on and on ya don’t stop. FBR Shop 5.60 eighth mile index class finds a good mix of bar and no-bar bikes running the number, including Jeremy Tealsey’s stock wheelbase ZX14R. Also look out for Knight on Marion Ford’s dragbike, Parker on his ’14, Shifflett on the Hillbilly Hustler and a whole pit-full of others. 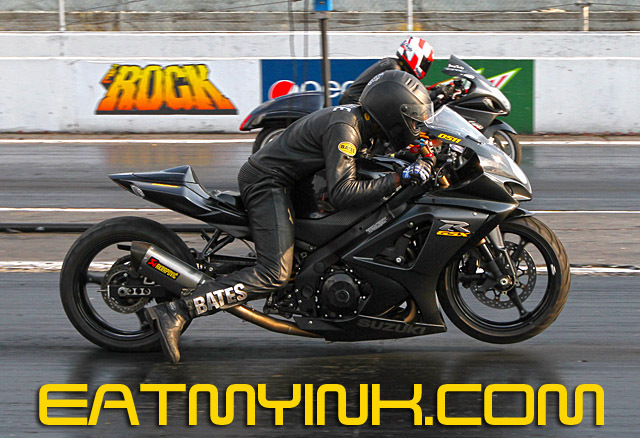 Brock’s Performance Street ET racers will be seeking their own share of the purse and limelight, with guys like Tennessee’s Dustin Lee, Michael “Ice Cold Killer” Herman Jr. and others looking to throw down for glory. And when you talk about glory, you’re talking about the very program that defines Rockingham Dragway—Afterdark Underground. Riders like Lavar “Lil’ Charlie” Delee, Jeremy Teasley, Richard Gadson, Dust and more wait for motor-mouths Alex Bud Light, Chachi, Country, CJ400 and more to seal the deal to race on the best that HTP, Adams Performance and Johnny Locklear have o offer.